EPM, Sway or Cold Back problems and even Arthritis! MY CERT Certification is no longer available, since 2011. I have since changed to my Levels Classes. I do this to protect my students and their clients from another ‘School’ trying to teach them. They are not Certified to, nor do they have permission to. To learn all my Rehab, you must come to all my classes, all Ala Carte Classes, to learn ECRM, and BTV Correction, as well as the EPM and cold back Rehab. Working as a CESMT since November 1999, I have worked on hundreds of horses. During that time, I came to realize that in order to really be able to help most horses, you must know more than ‘Just Massage’. 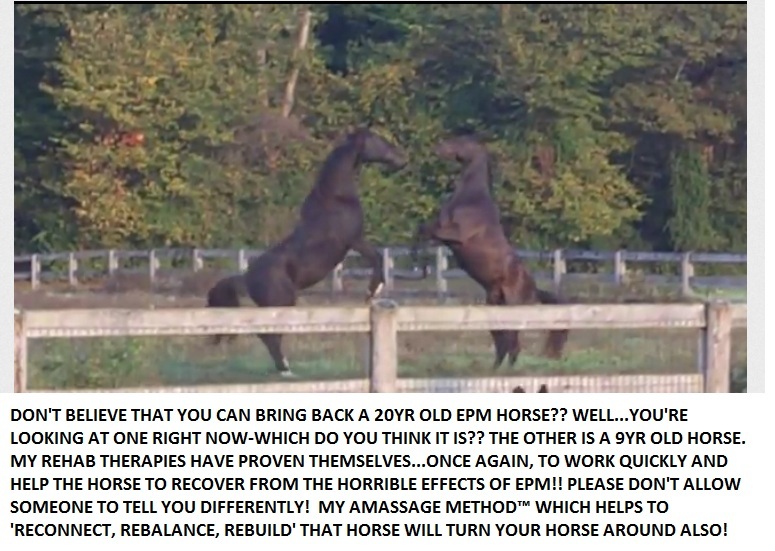 Doing just Massage, you leave your client to go back to old ways that more than likely caused the problem/damage to begin with-that is how I came to develop my own Rehab Therapies that will ‘Reconnect, Rebalance and Rebuild’ your clients horse, quickly and easily. I decided in 2006 to put together a class, and teach my Massage and Rehab Therapies to those wanting to learn. My students have done wonderful things with horses in their area-and I’m very proud of them. These therapies have taken me years to develop and to PROVE that they work. Very proud that I am the only person CERTIFIED to teach them, I have not given permission to anyone else to do so. I have improved them to include Under Saddle Balancing™ with the help of Dr. Nancy Nicholson. They are allowed to be USED by my students, in part only, to help rehab certain ailments-not to ever be taught in part or in full in any classroom or ‘course’ setting. Copyright infringement is the use of works under copyright, infringing the copyright holder’s exclusive rights, such as the right to reproduce, distribute, display or perform the copyrighted work, or to make derivative works, without permission from the copyright holder, which is typically a publisher or other business representing or assigned by the work’s creator. This above states that yes, you cannot even ‘tweek’ something that is copyrighted! This is from one of my students-who came to my class 2 yrs ago-MARSHA GEORGE (her contact info is on my students page), and is doing the therapy herself! You must watch it to believe it. These guys are playing like they’re 2yr olds. Any students from another course will also be considered as taking Trade Secrets. ANYONE else teaching these therapies is expressly forbidden and a copyright infringement, in full or in part.